Luminescent ATP Detection Assay Kit (ab113849) is used to measure the level of ATP within the cell. The luminescent ATP assay protocol involves lysis of the cell sample, addition of luciferase enzyme and luciferin, and measurement of the emitted light using a tube or microplate-based luminometer. This kit irreversibly inactivates ATP degrading enzymes (ATPases) during the lysis step, ensuring that the luminescent signal obtained truly corresponds to the endogenous levels of ATP. 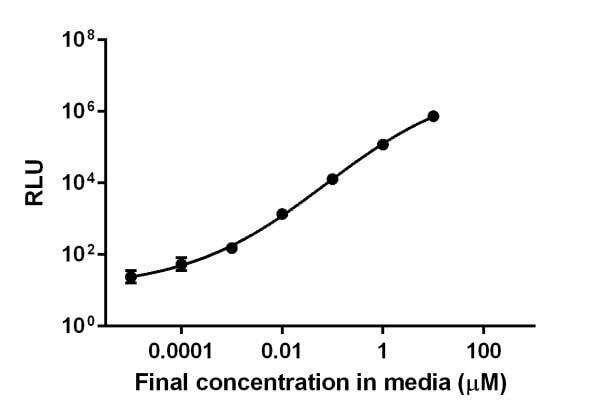 Total levels of cellular ATP can be used to assess cell viability, cell proliferation and cytotoxicity of a wide range of compounds and biological response modifiers. Total cellular ATP concentration. ATP in SH-SY5Y cells cultivated at 21% and 5% O2 24 h after treatment with A? 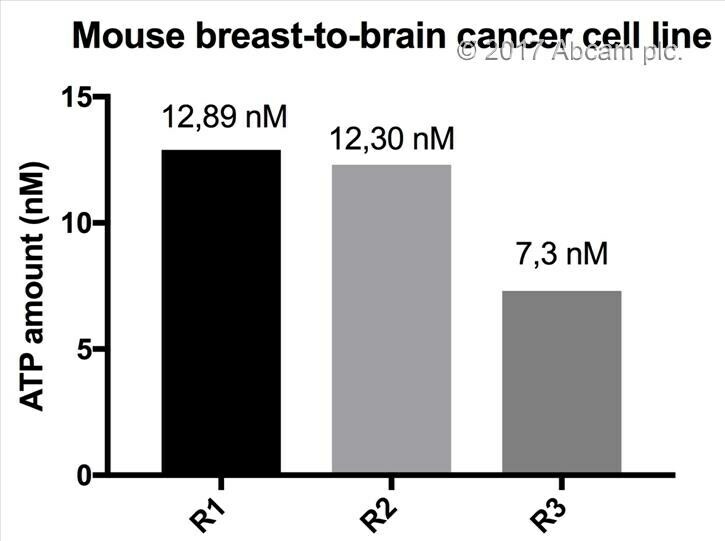 peptide and/or 18 h X-ray irradiation, normalized to cell count, and compared to respective controls. ATP concentration was about 1.3- to 1.8-fold higher at all conditions in cells cultivated at 5% O2 compared to 21% O2. Combination of A? peptide treatment and irradiation resulted in a significantly increased (~1.5-fold) ATP concentration at 5% O2 compared to the control. Samples were measured at least in duplicates (n = 2-4) in three independent experiments (N = 3). Mean ± SEM analyzed by two-way ANOVA with Tukey's multiple comparison test with p < 0 05 considered as significant. (∗∗p < 0 01). The ATP standard curve was prepared as described in the protocol. Background-subtracted data values (mean +/- SD) are graphed. ab113849 ATP detection kit cytotoxicity data. 25000 HepG2 cells were seeded into each well, allowed to adhere and treated for 4 hours with 25µM rotenone and vehicle control (DMSO) in glucose based complete media. After treatment, cells were lysed, exposed to the ATP substrate solution and signal was measured on a luminescent counter. Mean and standard deviation is plotted for 3 replicates from each condition. Rotenone induces cytotoxicity in HepG2 cells. Cellular Energy Flux for HepG2 cells (seeded at 65,000 per well), treated with a combination of drug compounds modulating the ETC (Antimycin A [1 µM] and FCCP [2.5 µM]), shown as a percentage relative to untreated control cells. Comparative measurements were taken with Extracellular Oxygen Consumption Assay (ab197243) (white column) and Glycolysis Assay [Extracellular acidification] (ab197244) (black column) show the shift between mitochondrial respiration and glycolysis and the cellular control of energy (ATP; measured 1h post-treatment using Luminescent ATP Detection Assay kit (ab113849) (striped column)). Extracellular detection of ATP (ab113849)This image is courtesy of an Abreview submitted by Heiko Lemcke. Analysis of the release of ATP by connexin hemichannels in stem cells using ATP luminescence kit (ab113849). Cells were cultured in HBSS to induce hemichannel opening. Calcium and GAP-inhibitor were used to trigger hemichannel closure. After two hours the supernatant was collected and ATP was measured according to the protocol (detergent was also applied). Calcium treatment and inhibition by GAP decreased ATP concentration, compared to HBSS control. Graph shows data of three independent experiments. The kit is very easy to use and the results are reproducible. 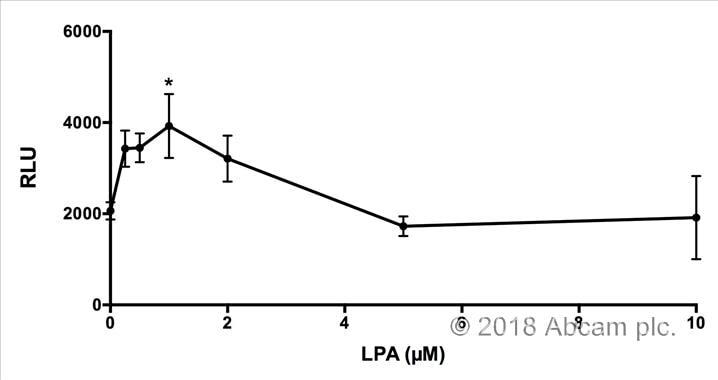 We used it to evaluate changes in ATP levels in primary murine microglia (in BV2 cell line as well) after treatment with various concentrations of lysophosphatidic acid (LPA). We have analyzed the release of ATP by connexin hemichannels in stem cells using the ATP luminescence kit (ab113849). After two hours the supernatant was collected and ATP was measured according to the protocol (we also applied the detergent). 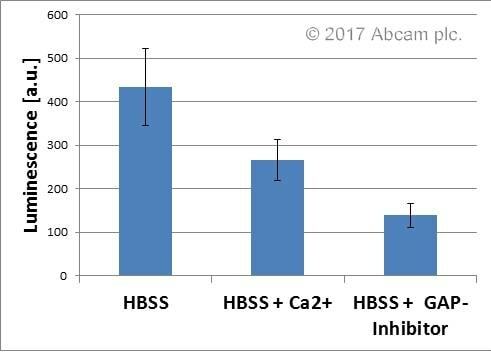 As expected calcium treatment and inhibition by GAP decreased ATP concentration, compared to HBSS control. Graph shows data of three independent experiments. In summary, we can recommend the ATP luminescence kit (ab113849) for measuring extracellular ATP concentrations. I enrolled to an Abcam trial to check the suitability of this ATP luminescence kit (ab113849) to detect extracellular ATP levels in cancer cells. I personally recommend this kit to measure extracellular ATP levels for its ease of use and for the kindly attention and help I received from the Abcam scientific support specialists. When measuring extracellular ATP levels, it is important to avoid light exposure as much as possible and measure the supernatant without FBS and without phenol-red. I seeded 50.000 murine breast-to-brain cancer cells in duplicates or triplicates in 96-well-plate. Once they are attached I starve them in FBS-free and phenol red-free media. 24 hours after starving I collected the supernatant (100 ul) and transfer it to a white opaque plate. There I followed the protocol proposed in the booklet with only one difference: I do not use detergent. Using the same conditions (cell line, passage, starving time and machine) I repeated 3 times with the same cancer cell line and the results I got are 12,89 nM ATP, 12,30 nM ATP and 7,3 nM ATP. Regarding the conditions I use, I repeated this procedure several times and I chose this condition (24-hours starvation in phenol red-free and serum-free media) because if I starve them for less hours the luminescence units I get from my samples are super low. If I starve them with HBBS overnight the cells look ugly the following day. Moreover I also tried to add detergent in the media but then the RLU I got were more variable in the same biological replicate. There is also higher variability of RLU if I use media with FBS. I did not try to use media with phenol red because I know it interferes with the luminescence readout. To sum up, I got less variability when I starve them for 24 hours with DMEM without FBS and without phenol red. Inquiry: Hello, I've used the Luminescent ATP Detection Assay Kit to determine the concentration of ATP in E. coli cells. The kit worked perfectly. My question is, will the lysis protocol denature ATP binding proteins such that they release ATP allowing it to take part in the luminescence reaction? Has any work been conducted on this? We haven’t addressed this question experimentally with the reagents. The answer is probably. The lysis reagent is denaturing so bound ATP may be made available to the luciferase. This would be difficult to be definitive and different ATP binding proteins may behave differently. Is the Luminescent ATP Detection Assay Kit (ab113849) suitable for use with plasma samples, or is it purely for use with cell samples? In theory it should work, but we don’t know for sure as we have not tested it. Therefore, if you are willing to test and publish the data in the form of review on our website then I would like to invite you to our Abtrial programme. Luminescence does not have multiple wavelengths. In Luminescence mode, the instrument simply measures the emission of visible light from the well. What is key in the measurement is the PMT (photomultiplier time). This acts like the aperture of a camera. The higher the number, the more light gets captured. My suggestion is to accept the default PMT settings of the instrument. If working with an opaque plate, you may be able to have lower PMTs which will allow for a lower background and greater sensitivity. Either opaque or transparent plates could be used (as shown in the protocol booklet). The advantage of opaque plates is that it allows for a wider dynamic range. This assay is designed for end-point reading. For development of signal timing, see section C/steps 5 and 6 of the protocol. The cells do not need to rest or adhere for this assay, you can measure right away. Can you please provide the customer with the list of the detergents and their concentrations which can harm the luciferase reaction or any other stage of ATP reaction? Thank you very much for your help. Any anionic detergent will inhibit the luciferase reaction. What is interesting is that non-ionic detergents have the opposite effect and can in fact enhance the luminescent signal. The following detergents used between 0.5 and 1.5% can enhance the signal = Triton X100, Tween 80, Tween 60, Tween 20. Note that Triton X-100 could potentially rescue the inhibition of SDS. Other potential components of detergents that could also inhibit the reaction are monovalent metal salts such as KCL at concentrations greater than 1uM, Very high concentrations of divalent metals such as Magnesium (>3mM), Manganese (>2mM) and calcium (>1mM) as they all show a bell shape curve in regards to their effect to the activity of luciferase. Cell lysis buffers may contain DTAB (0.05 - 2%), BDDABr, sulfobetaine 3-10, , deoxycholate* < 0.05%) and NaF (1-20mM) as ATPase inhibitors, cell-lysing agents like TCA, CTAB or ethanol and enzyme stabilizing agents like THESIT (1-5%), BSA or gelantin. Our customer intends to use ATP luminescent kit (ab113849) in order to quantify ATP concentration in lysates containing 4% SDS and 50 mM DTT. Please advise if such concentrations of DTT and SDS may influence the ATP kit components and thus the test correctness. Thank you in advance for your assistance and reply. SDS is a very strong inhibitor of the luciferase reaction. The lowest possible concentration will likely be below 0.05%. We suggest the customer running a standard ATP curve with and w/o SDS to determine empirically the effect. Theoretically, DTT will not affect luciferase reaction up to a concentration of 50 mM. However, we don’t know what the effect will be on the ATP luminescent kit. Is it possible to use a fluorescent protein quantification kit/reagent with Luminescent ATP detection assay kit (113849)? I'm looking for a method to standarize results obtained with the ab113849 kit eg. to know if the differences in ATP level are not a result of unevenly seeded cells... Wouldn't it interefere? Could you advise me such fluorescent protein quantification kit? The mammalian cell lysis solution contains 0.1M of alkaline solution. I don't think it will be compatible with protein quantification. Indeed, changes in ATP may be due to unevenness in seeding or low viability. Using multiple replicates per each data point will lower the chances of basing a result in uneven seeding, since low reproducibility could be a sign of uneven seeding from well to well.